Be the first to share your favorite memory, photo or story of Admiral Gerald. This memorial page is dedicated for family, friends and future generations to celebrate the life of their loved one. Gerald Eustis Thomas, 89, a retired Rear Admiral and U.S. Ambassador passed away on March 20, 2019 in New Haven, CT. 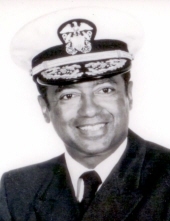 He was the second black officer to achieve the rank of Admiral in the United States Navy. Admiral Thomas was born in Natick, Massachusetts on June 23, 1929, the son of Walter W. and Leila L. (Jacobs) Thomas. He received his BA from Harvard University in 1951, and as a member of the NROTC, was commissioned as Ensign upon graduation. As a career officer, Admiral Thomas earned his MS from George Washington and his Ph.D. from Yale University. He held several sea commands including Destroyer Squadron Nine, and Cruiser Destroyer Group Five. He served as Director of the Near East South Asia Region in the Office of the Assistant Secretary of Defense, and from 1978 until his retirement in 1981, commanded the Training Command of the Pacific Fleet. Admiral Thomas was appointed U.S. Ambassador to Guyana by President Reagan in 1981, and in 1983 was named Ambassador to Kenya. In 1986, Admiral Thomas joined the Yale community in a joint appointment as a Lecturer in the departments of History and African-American Studies. At a later date, he was appointed Master of Davenport College, and served in that capacity for ten years. He held memberships in several professional and social organizations, including Alpha Phi Alpha Fraternity and the Beta Tau Boule of Sigma Pi Phi Fraternity. Admiral Thomas leaves his wife of 64 years, Rhoda, and their three children: Dr. Kenneth A. Thomas of Woodbridge, CT, Hon. Steven E. Thomas (Pamela Smith, Esq.) of Westwood, MA, and Lisa Thomas Jacobs (Col. Lee Jacobs) of Poway, CA, as well as many loving grandchildren. Friends may visit with the Admiral's family at Beecher & Bennett Funeral Home, 2300 Whitney Ave., Hamden on Tuesday, March 26th from 10:30 a.m. prior to his service, which will begin at 11:00 a.m. Burial with full Military Honors will follow in Grove Street Cemetery, New Haven. Donations in his memory may be given to Parkinson's Disease research. To send flowers or a remembrance gift to the family of Admiral Gerald E. Thomas, please visit our Tribute Store. "Email Address" would like to share the life celebration of Admiral Gerald E. Thomas. Click on the "link" to go to share a favorite memory or leave a condolence message for the family.